The Sun is over 1.39 million km wide but if it were the size of a washing machine, Pluto would be 4.2km away - and the size of a pinhead. The vast distances in our Solar System are difficult to comprehend - so the SpacedOut project intends to bring the scale down to Earth - or rather the UK. The project opens from Friday for the start of National Science Week. Its sculptures representing different space objects will stretch from the Shetland Islands to Cornwall. "It incorporates models that represent the Sun, the planets, Halley's comet and numerous asteroids," said project director Nigel Marshall. Icy bodies such as Centaurs - which orbit roughly between Neptune and Saturn - and Trans-Neptunian Objects (TNOs) - which circle the Sun out beyond Neptune - are also included. "The project is supported by a dedicated website which we hope will become a unique and valuable national resource for astronomy and space science in the future," added Dr Marshall. The scale of 1 to 15 million reduces the distance between the Earth and the Sun to about 10km (6 miles). However, with the Sun located at Jodrell Bank Observatory, Cheshire - home of the Lovell 76m (250ft) radio telescope - Pluto is still as far away as Aberdeen. "The distances are so great it is very hard to imagine - I think this project is brilliant," said Ian Morison, operations engineer at the observatory. "We are very proud that Jodrell has been chosen to be the centre of the Solar System." On the same scale, the nearest star, Proxima Centauri, would be about seven times further away than the Moon. All the models have 1m diameters. "If the sizes were also scaled, the Sun would be almost 100m across with Pluto about the size of a melon," said John Thomson, education consultant to the project. The project unites art, science and technology. The models are sculptures or artistic representations. "The model of the Sun is not a yellow sphere with dots on it - it's rather more interpretation," said Dr Marshall. 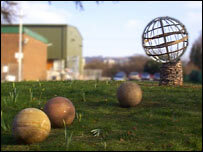 Most of the objects are located in school grounds. Others are in visitor attractions, such as the National Space Centre in Leicester and the Armagh Planetarium in Northern Ireland. The scale has fortuitously placed Uranus in Bath - where William Herschel lived when he discovered the planet in 1781. Nine sites will open in Science Week - a further nine sites will be opened later in the year. "The remaining sites are very important to the overall representation of the Solar System. We just have to bear in mind that the planets in our Solar System took about 100 million years to form - our models have been created in under a year," said Dr Marshall. School children across the country have been involved in the design of many of the models. 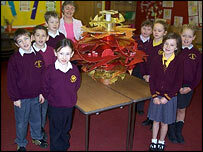 The Sun is based on the concepts and models made by children at Sacred Heart Primary School in Oldham. David Murgatroyd, a father of a pupil at the school, involved his company, Amari Plastics, in the manufacture of the sculpture. With members of the project team he visited a class of Years 3 and 4 to explain some of the properties of plastic - and was deluged with questions, including "What is plastic made from?" and "How do you get colour in it?" Images of the pupils' designs and artwork are available on the SpacedOut website. "There is an eclectic mix of learning, science and art on the site- it is quite an impressive tool," said Dr Marshall. "It allows visitors access to all the artistic installations, profiles of artists and sculptors, astronomical information and links to other space science and astronomy websites in the UK." In addition, teachers will be able to use the website as a major resource. "They have the opportunity to download free educational information for use with their pupils - these resources are aimed at both primary and secondary schools, and for those studying GCSE astronomy." said Dr Marshall. Through the project, the SpacedOut team hope to increase public awareness and understanding of the vastness of space, and to encourage young people into science-based studies and careers. "We really want to demystify science - to expel some of the myths. "Many of the general public are not aware of the difference between astronomy and astrology. When I'm asked I reply that one's a bit of fun - the other is a lot of fun," said Dr Marshall. Members of the general public are welcome at any site opening, but are advised to confirm details of times and parking arrangements with the organisers. Further details about the project are available on the website www.spacedout-uk.com.